Cockroaches can be found anywhere, in homes (especially the kitchen), where you socialise or the workplace. For that reason pest control services are needed all year round and in all environments around the Macclesfield area, to help with the removal of an infestation of these unwanted guests. 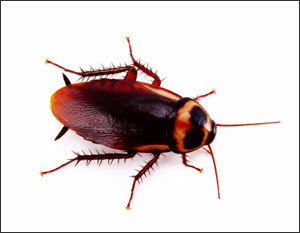 While many people think that Cockroaches are a pest that only live in older homes, the truth is that any dwelling could become a residence for these household pests. Cockroaches carry disease and a cockroach infestation can pose a serious health risk to yourself and the public, and any such problem is a matter that you should deal with straight away. Decease can be distributed from the body of the cockroach and also from the droppings that the cockroaches leave behind. They will feed on almost anything they can digest which includes faecal matter. Contamination and the spread of disease occur when the cockroaches come into contact with foodstuffs, passing the germs on. A cockroach known in a catering establishment will result in closure and could financially cripple a business. Due to their large size and slow development, large infestations of these insects are not common within houses. However, during certain times of the year, these cockroaches may move inside a house from outside. In cold weather these cockroaches may move indoors, seeking warmer temperatures and food. With the exception of the female Oriental cockroach, the adults of these the cockroaches found in the UK have well-developed wings. However, they almost never fly; movement by both the adults and the wingless nymphs is by walking or rapid running. These three cockroaches can be distinguished by colour and size. Adult German cockroaches are tan to medium brown in colour and fairly small in size (10-15 mm). Adult American cockroaches are reddish brown in colour and large in size (35-40 mm). Adult Oriental cockroaches are fairly large in size (26-30 mm) and are shiny, dark brown or black in colour. The cockroach lifecycle actually has three developmental stages. These stages are known as the egg, the nymph, and the adult stages. The lifecycle starts in an egg that is put into a case with six to 40 eggs at a time. These cases are often hidden away for safe keeping. Some cockroaches choose to keep their eggs safe internally whilst others still carry the case around with them until the eggs are ready to hatch. The cockroach lifecycle gets a bit more exciting when the eggs hatch and the young cockroaches are very small and known as nymphs. The nymphs must go through several stages of moulting, where their body will be quite soft and white. Each time the moulting process is completed the cockroach will get bigger, change in colour, and look more like an adult cockroach. The nymph stage of the cockroach lifecycle can take anywhere from a month and a half to several years, depending on the environment, the type of cockroach, and the prevalence of cockroach disease and parasites. Cockroaches may enter houses through sewer connections, under doors, around plumbing, air ducts, or other openings in the foundation. At Town & Country Pest Control we work out an integrated and thorough programme with the use of insecticides to control the Cockroach problem. The process may take many visits from a pest controller to get the infestation under control. Insecticides are the best methods to use for the control of an infestation. Dust or wettable powders that can be sprayed or dusted into the affected areas. Gels are also a good method of poisoning the cockroaches and depleting an infestation in your home or business. Keeping your space clean is important to cockroach control. Crumbs must be cleaned away, or else those small particles will encourage the uninvited pests to remain in the home. Make sure the kitchen, dining room, and any other area of the home where residents consume food of any kind is free of all types of crumbs. Even dirty dishes can undermine your best efforts at cockroach control. Make sure all dishes are washed and put away before bedtime. If dishes must be left until morning, place them in the sink and cover them with hot soapy water. Cockroaches tend to steer clear of water containing dishwashing liquid. © Town & Country Pest Control | All rights reserved.